Uttrakhand-based Green Valley Enterprises is a well-known supplier of Liquid Hand Wash. 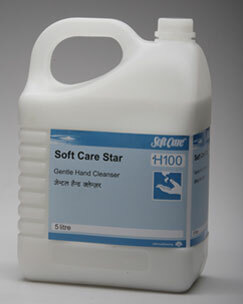 The Liquid Hand Wash is available under SOFTCARE STAR brand name. This white colored pleasantly perfumed hand wash provides rich lather. This Liquid Hand Wash is gentle on skin & keeps the skin soft & supple even when hands are washed many times in a day. It is used by dispensers and our imported dispensers can dispense 3ml at one time, so the cost of one wash is 32 paisa only.